While Republican New Jersey Governor Chris Christie was vacationing in Disney World this week, he was taking a few shots back home from some of his Democratic opponents as the state dug out from a blizzard that dumped more than two feet of snow in some places. Christie's office is now pushing back against complaints that both he and the also-Republican lieutenant governor should never have taken a vacation at the same time, especially during a snow emergency. While Christie hit up the Magic Kingdom, and Lt. Gov. Kim Guadagno was in Mexico, State Senate President Stephen Sweeney, a Democrat, had been serving as acting governor in their absence and coordinated response efforts. That prompted Democratic State Sen. Raymond Lesniak to question "the purpose of the office" of lieutenant governor, which was created in 2005, largely in response to the fallout from when former Governor Jim McGreevey left office suddenly. "We clearly made a mistake...and wasted money if the lieutenant governor is not going to be here when the governor is out of state," said Lesniak, according to NorthJersey.com. In a response Tuesday, Christie spokesman Michael Drewniak told The Hill newspaper that the criticism of the new governor was "overblown." "Yes, this was a big snow, but we are a northeastern state, and we get plenty of snow, including heavy hits like this," he wrote in an e-mail. "But the sky really is not falling, and we'll get through this just as we always have, notwithstanding complaints from opportunistic partisans like Lesniak." Lesniak, while himself on vacation in Florida, responded by saying that Christie's office was downplaying the situation in an attempt to not make a bad situation worse. "Thirty-one inches of snow. Hundreds of serious incidents, roads closed down, states of emergency. This is not an insignificant incident... This is serious," Lesniak said, according to NorthJersey.com. "I think it points to a real revaluation of at least the way this office is being handled in the future." 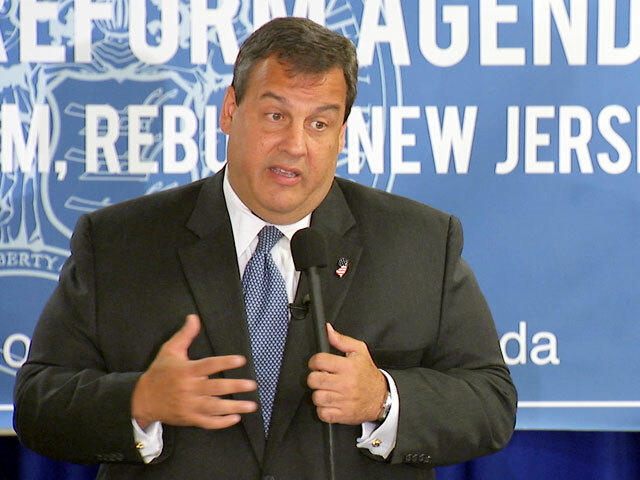 For his part, the acting governor of New Jersey while Christie is away, Sweeney, said he doesn't want to get involved in the dispute. "It's easy to criticize. I'm not going to do that. It happened. There was a scheduling conflict," said Sweeney, according to NorthJersey.com. "I am sure for the governor, this was not the ideal situation for him, me being a Democrat him being a Republican." While this appears to be a domestic squabble, Christie has drawn the admiration and attention of Republicans nationally for his straight-talking, tough style, and his Christmas holiday in the Magic Kingdom has been fodder for political media across the country. Hanging out with Mickey Mouse while backs all over New Jersey ache under the strain of shoveling two feet of snow will probably not help his poll numbers at home either. The Hill also reports that Christie's popularity in New Jersey slipped five points in a Quinnipiac poll released this month.